Joseph and I have decided it’s time to educate folks on how to be a Southerner. Here’s a helpful post on how to be just that. If you answered “a”, congratulations. You can stop reading now, this isn’t for you. If you answered “b”, this post is for you. If you answered “c”, turn off your computer, throw it out the window, and stay off the Internet. Forever. Northern guy: One time, at a barbecue, I ate so many hamburgers and hot dogs I got sick. Me: You mean at a cookout? Northern guy: Yeah, same thing. I then tried to explain to him the difference. In this particular setting, several other northerners and west coasters came to his defense. 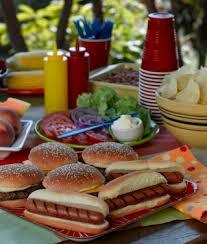 Even doing a quick google image search of “barbecue” shows how few people actually get it. That conversation happened almost 7 years ago, and it still bothers me today. So…I figured I’d explain the difference. Wikipedia, which we know to be infallible, differentiates between the two. “Barbecuing” is the act of slow cooking meats over indirect heat. “Grilling” is fast cooking over a direct flame, also known as a “cookout”. So, now, you understand the difference, at least on a technical level. But it’s still more than that. If I invited you to said cookout, I’d throw the stuff on the grill at 6 and we’d be eating by 6:15. I’d fully expect you to show up with a pasta salad, or some chips, or maybe some baked beans. Maybe I took 30 minutes of prep time for the burgers, or maybe I was lazy (probably because we aren’t that close) and just bought those pre-made patties, poured some Worchestershire (or however you spell it) on them, sprinkled some Tony C’s, and threw them on the grill. Pretty simple. We’d eat the burgers, maybe have a beer or two (or a Coke if more than one Baptist showed up), and everyone would be on their way. We’d all walk away relatively clean, and we’d laugh about what a fun time we had. That beautiful firebox…indirect heat, son! If you’re really lucky, I’d say “hello, <insert name here>, do you want to come over around noon when I throw the ribs on the smoker and hang out all day?” And your answer, if you are a sane person, would be “Absolutely I do.” Because that is the sign of true friendship. Seriously – there’s nothing better than sitting outside on a nice day smelling ribs on a smoker. It even makes something as terrible as baseball enjoyable. Simply stated, if you answered “b” to the above test, you’re seriously missing out. Barbecue takes many forms – it can be Texas** brisket, North Carolina pulled pork, or Memphis ribs. *** But whatever form it takes, the distinction between a “cookout” and a “barbecue” is very, very important for eating in the south. *It is very important that you not make the mistake of wearing nice clothes to a barbecue. It’s probably also a good idea that you not go to a barbecue with someone you are either interested in or in the beginning stages of a relationship with. You may see things that will haunt the rest of your relationship. **Not the south, but Texas brisket is amazing. I was late to this revelation, so I missed several good years of life. But sliced brisket with a touch of hot sauce…be still my soul. ***St. Louis ribs are often grilled. This isn’t to say grilled ribs are bad, it’s just to say grilled ribs aren’t barbecued. sometimes funny. occasionally serious. just kind of along for the ride. On Firefox, click on ‘Tools’ then ‘Options,’ and go to the privacy tab. after that, just change the item of ” device type ” to ” no “. Others call a computer technician and ask him to upgrade whatever there is to upgrade. So profoundly correct on what I’ve said for years, I just had to link to this post from my own blog, grillremarks.com. Showing once again, if there’s a question about anything to do with fire, smoke and meat, don’t ask the Yankee or the surfer in the room, defer to the Southern boy for the correct answer. Hmm… I am from Philly and I have never once heard anyone refer to a cookout as a BBQ. We all say “come over for a cookout” ( which mostly means come over and drink beer with me and if I remember we’ll put something on the grill…or order a pizza and eat it outside). We don’t even say BBQ up north unless referring to chips or sauce.